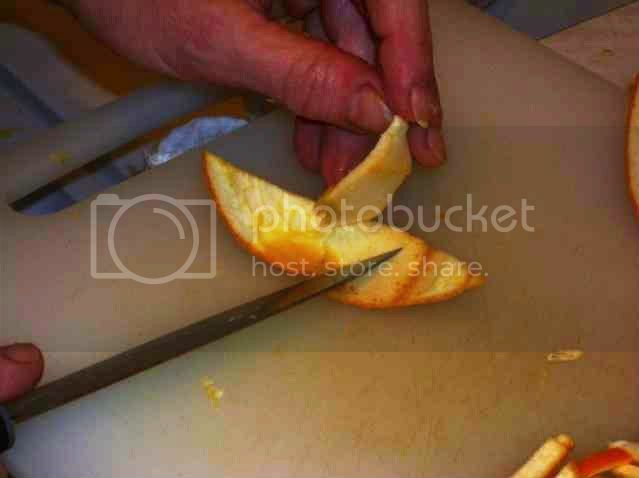 Cooking For Engineers :: View topic - Marmalade Making: Step-By-Step Photo Recipe. 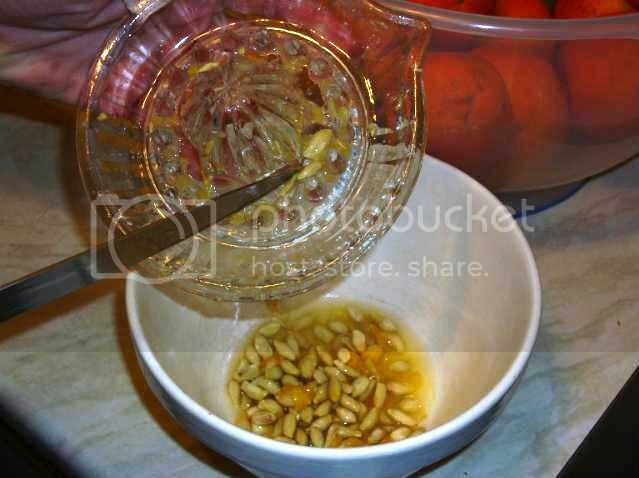 Marmalade Making: Step-By-Step Photo Recipe. 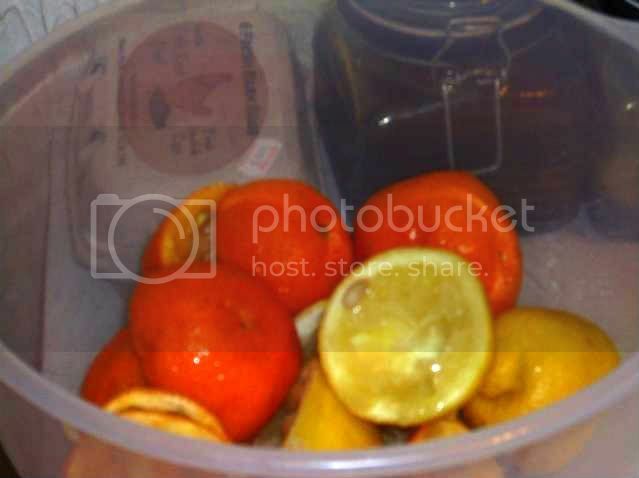 Posted: Mon Feb 22, 2010 10:13 pm Post subject: Marmalade Making: Step-By-Step Photo Recipe. Lois & I had our first attempt at making Marmalade last night, and we are both proud of efforts; it also tastes surprisingly good. 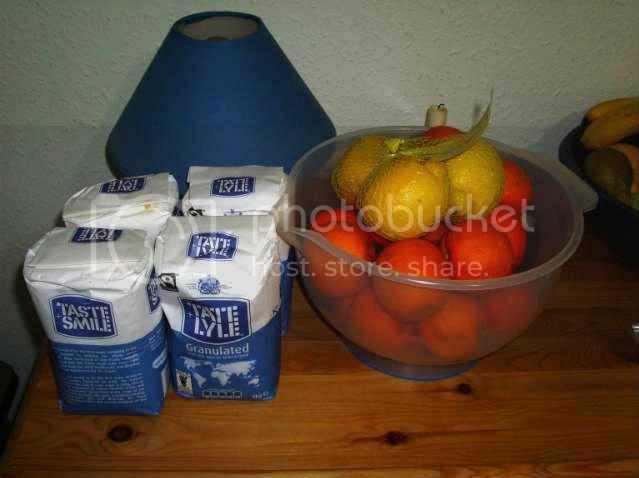 4 kgs White granulated Sugar. 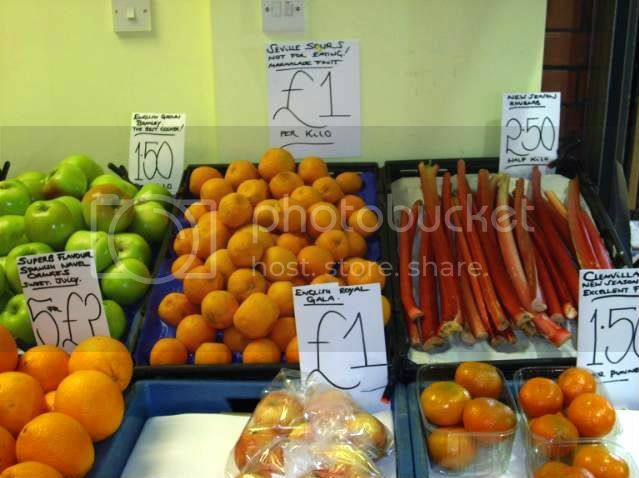 Half the Oranges and Lemons and then juice them, add the juice to the water in a large preserving pan, save the pips, pith and pulp, and place in a seperate ceramic bowl. 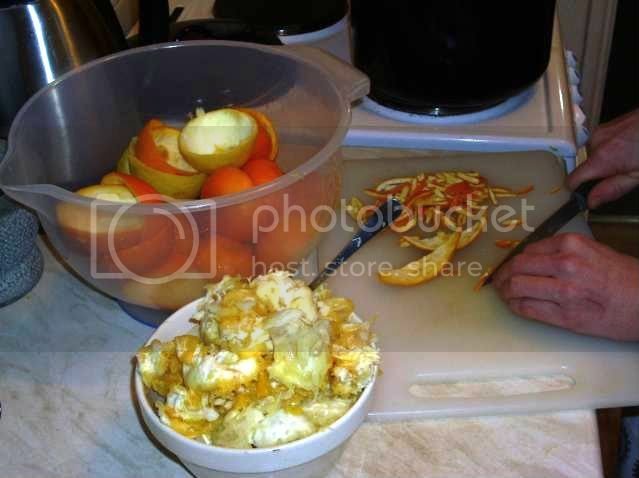 Scrape out all of the remaining; pith, pips and pulp from the fruit skins, and then slice the skins into thin stripes, and place into the pan with water. 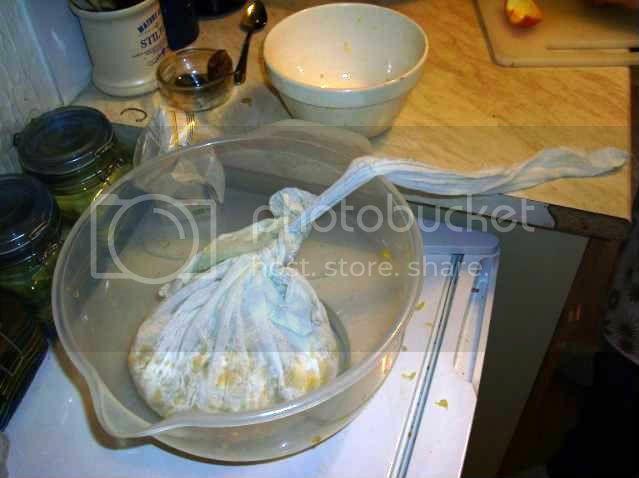 Place all of the; pips, pith and pulp on to a large square of muslin, and fold up into a bag shape, secure the bag with a tightly knotted strip of string, etc. Hang the bag of pulp in side the pan, and tie off the remaining strip to the pans handle to allow easy removal of the bag from the very hot pan. Bring the whole lot to the boil, turn down to a simmer; but leave uncovered without a lid to help reduce it a little. 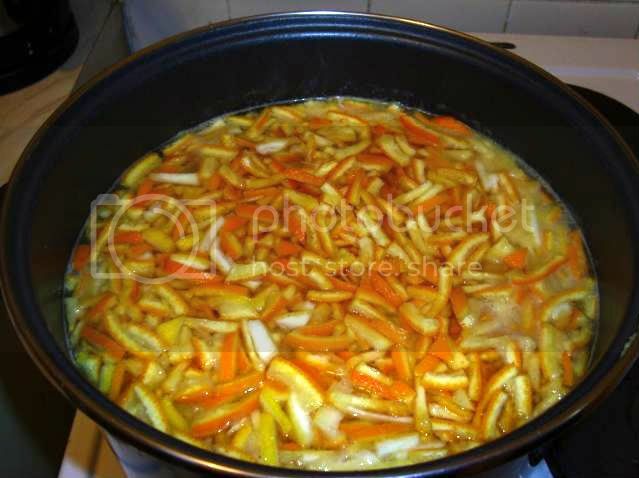 Simmer for at least 2 hours or until the stripes of Orange have softened. Leave the pan on the heat as you remove the bag of pulp, pith and pips and place in a seperate ceramic bowl safely to one side. 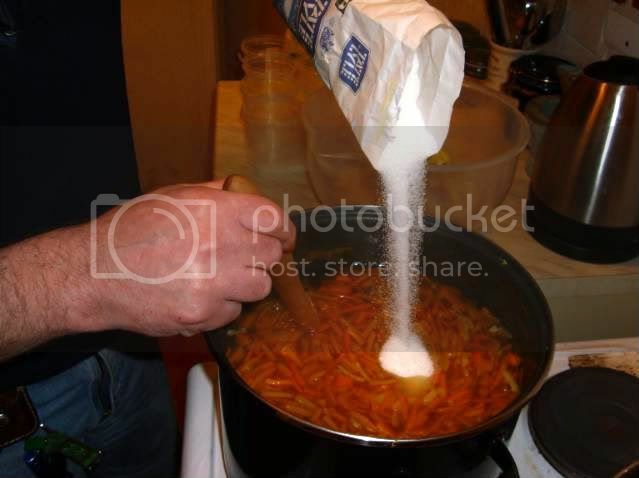 Steadily add the sugar, constantly stirring to dissolve it. When you are certain that all of the sugar has dissolved, bring the whole mixture back up to the boil, and then turn down to a rolling boil. 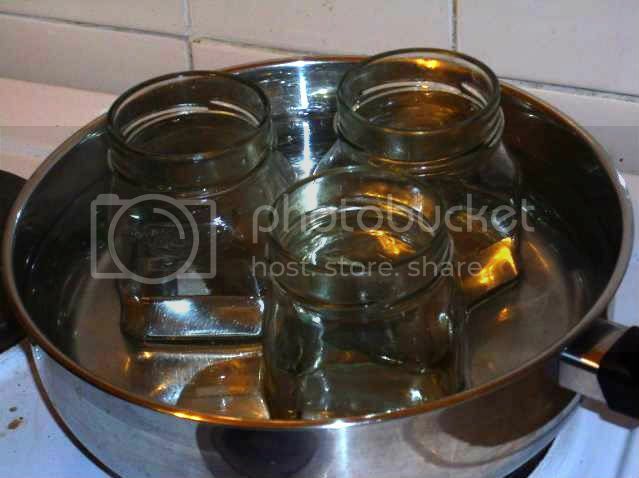 Meanwhile: place the previously cleaned and sterlised glass jars into a frying/sauteé pan filled with water and bring up to the boil. 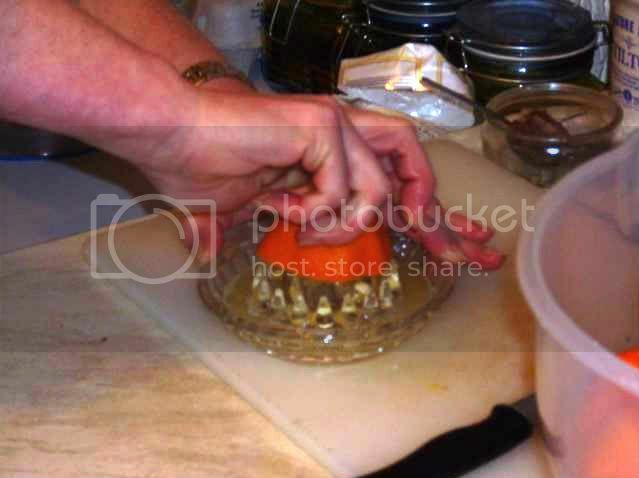 This is to prevent the glass from shattering due to heat shock when they are filled with the hot Marmalade mixture. 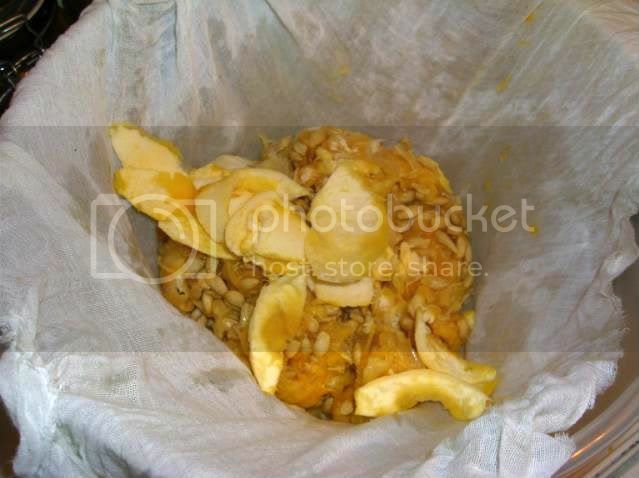 After the mixture has been on the rolling boil for 15 minutes, wring out the bag of pulp to obtain the pectin from it. 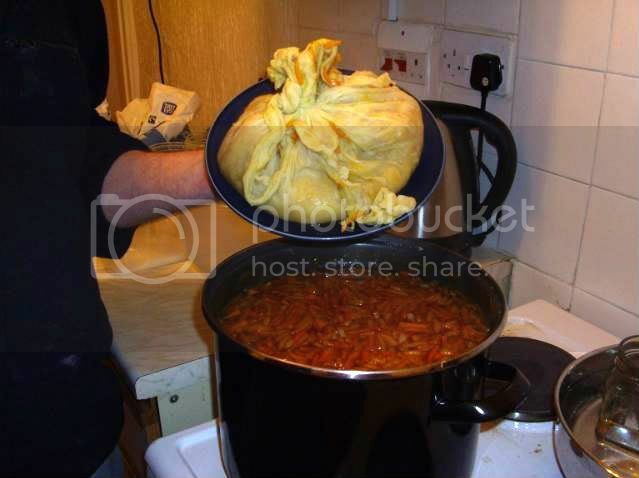 This will still be hot, and so one of the most efficent ways of doing this, is to place the pulp bag between two tea plates, and then squeeze them together very tightly. 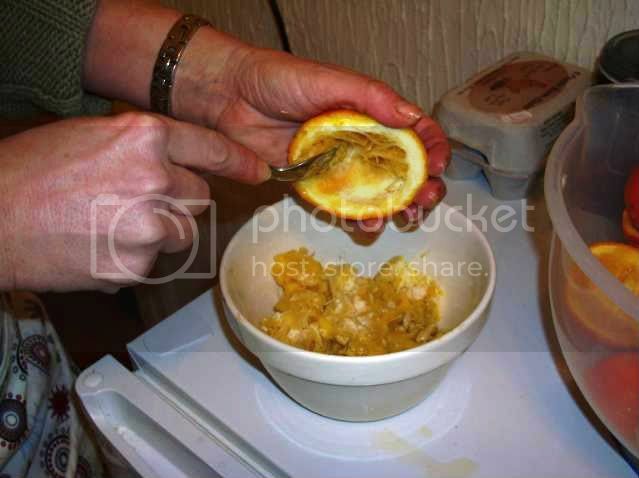 Extract as much of the Pectin from the pulp as you possibly can. Add the Pectin to the main pan which should still be on a rolling boil. 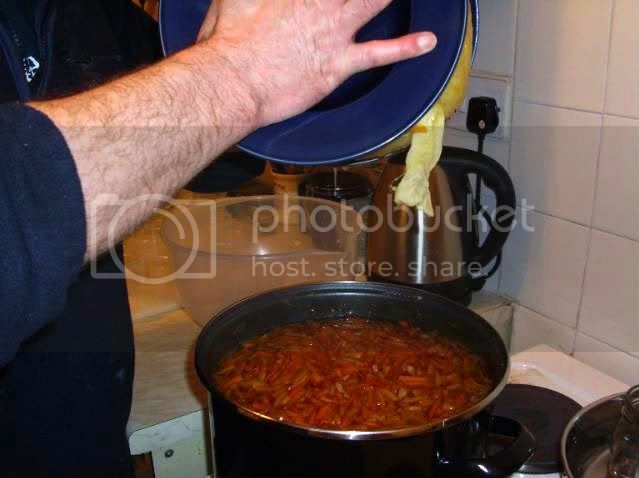 Continue the rolling boil for another 15 minutes; the mixture may be seen to thicken slightly, and you should stir it with a wooden spoon to prevent any of the Marmalade mixture from sticking to the bottom and sides of the pan preventing localised burning. 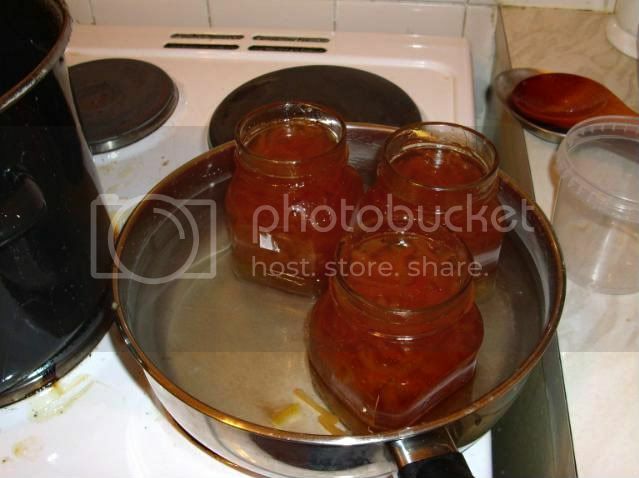 Ladle or pour the hot mixture of Marmalade into the awaiting jars, cap tightly with the lids and allow to fully cool before moving. 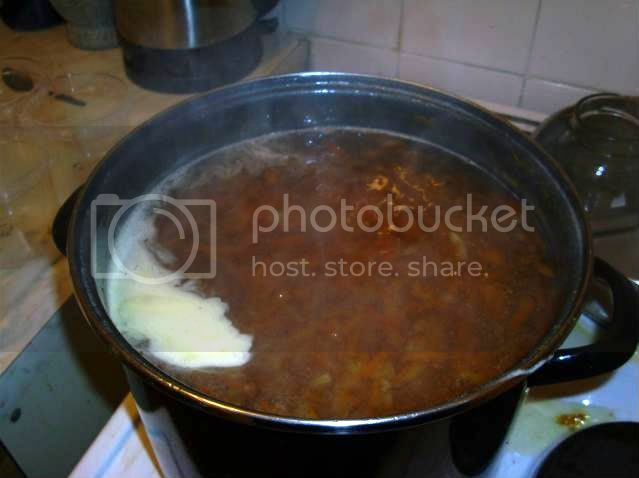 Note: the boiling mixture of Marmalade is extremely hot, and can cause serious and severe burns. 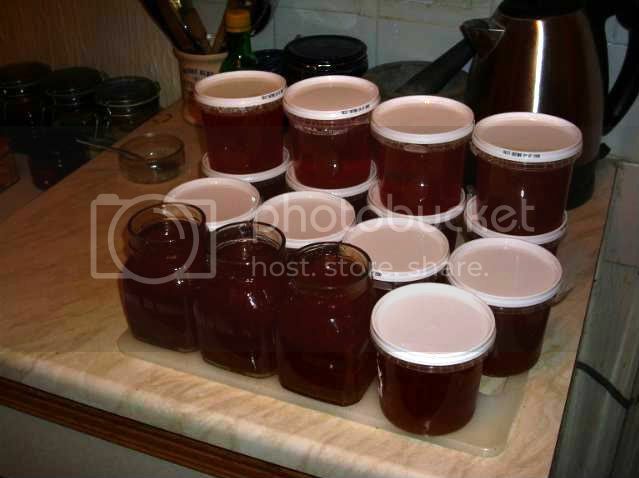 When it has fully cooled, then you can begin enjoying your home-made Marmalade. If possible put some away in a dark, cool cupboard, as it will mature with age. Place all of the Pith, Pips and Pulp on to a square of muslin, and tie up into a bag. Bring it all to the boil, and simmer for 2 hours. 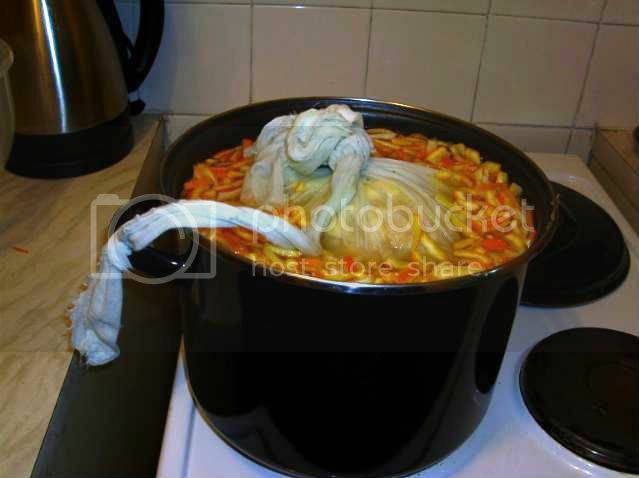 Remove the bag, and place it safely in a ceramic bowl for later.